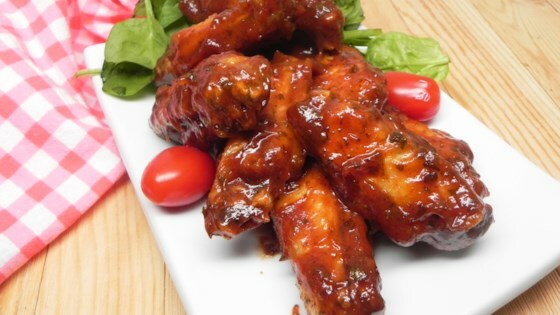 "Moist and tasty chicken wings that can go with anything. I could see these going well with rice." Mix barbeque sauce, honey, and ranch dressing together in a large bowl. Dip wings in the sauce until coated. Transfer wings to a 6-quart slow cooker; pour any remaining sauce on top. Cook on High until no longer pink at the bone and the juices run clear, about 4 hours. An instant-read thermometer inserted near the bone should read 165 degrees F (74 degrees C). You may need to adjust quantity and cooking times depending on the size slow cooker used. I think they came out a bit overcooked. However, I just went by the time and did not bother checking the temp. Next time, I will start checking the temp after 2 hours. I am a big fan of smoking meat and cooking Barbeque on the pit. But this recipe is a very good substitute for cooking on the pit. The taste was as good as pit cooked.